Hillandale Golf Course was looking for a boost in their online presence. 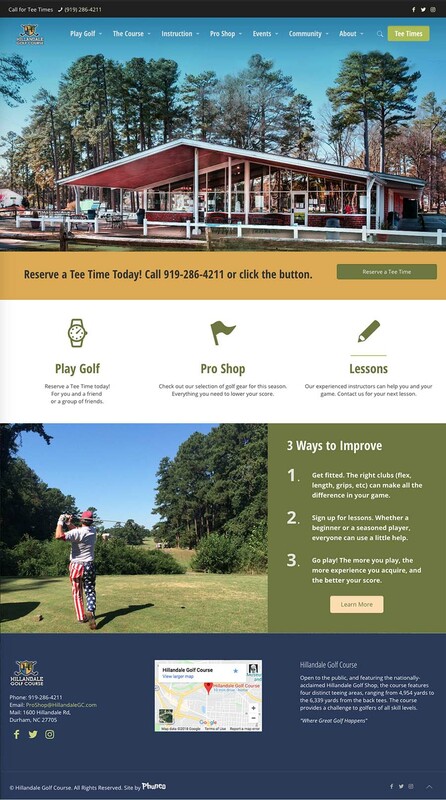 They needed a site that not only directed experienced players where to get a tee time, but encourage new players to request lessons and get properly fitted. Phunco constructed a site that simplified the efforts players needed to request a tee time. The pro shop phone number is now at the top of the site. And the link to online Tee Times is now a button on the top right of the site. When viewing on your mobile phone, the two links are the first thing you see. Phunco reorganized the content to create a more enjoyable experience for the visitor and staff. Pushing the three main money making items to the front of the site: Play golf, Buy golf lessons, and Buy golf equipment.